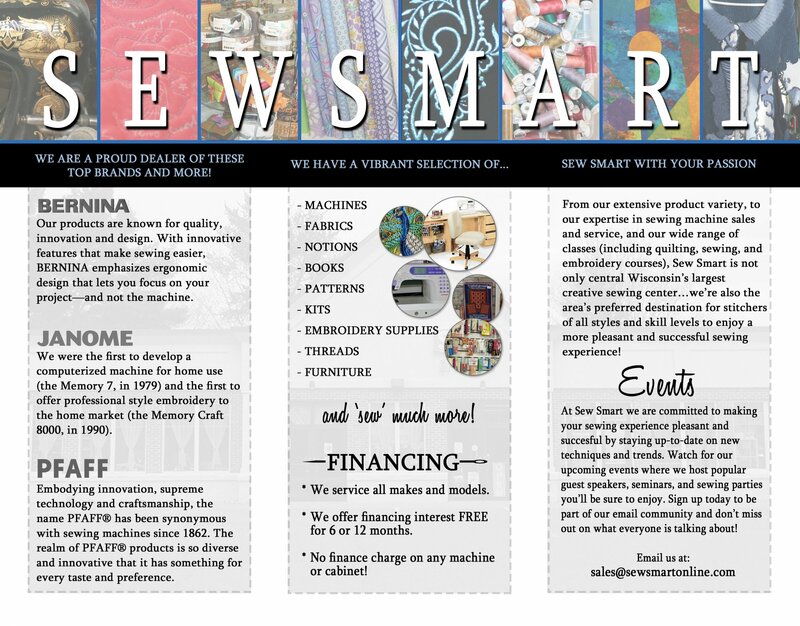 Sew Smart | Serving central Wisconsin for over 10 years! Sew Smart has been serving the sewing communities of central Wisconsin for over ten years! With two convenient locations, in Wausau and Rhinelander, we bring you the best in sewing machine sales and service, along with a vibrant selection of quilting fabrics, sewing notions, books, patterns, kits, and embroidery supplies. We’re committed to continuing education to ensure that the products and services we provide are the finest the industry has to offer. Our knowledgeable, well-trained staff specializes in personalized service, whether they’re helping you select fabrics or a new machine. Additionally, our on-site technicians have completed multiple certifications to keep your sewing machines in optimum condition. While our Wausau location offers a huge selection of toy and vintage sewing machines that is sure to thrill any sewing enthusiast, both of our shops offer plenty of store samples, high quality merchandise, and fun ideas to inspire your creativity and help you complete your projects from start to finish. From our extensive product variety, to our expertise in sewing machine sales and service, and our wide range of classes (including quilting, sewing, and embroidery courses), Sew Smart is not only central Wisconsin’s largest creative sewing center…we’re also the area’s preferred destination for stitchers of all styles and skill levels to enjoy a more pleasant and successful sewing experience!